Rhoda, a 41 year-old professional woman, has had a facial eruption off and on for a number of years. It began with perioral dermatitis but evolved over time to the “red face syndrome.” What follows is her story and her dermatologist’s office notes. I had been diagnosed with perioral dermatitus many moons ago and was prescribed some wonderful topical steriod ointment to treat the red, ugly, pimply like eruptions. My dermatologist clearly warned me….”do not keep using this medicine, it will rebound and makes things even worse.” At the time I took it seriously; used the ointment for a few days and things cleared up nicely. Then the monster returned!!!!! I, of course, was super busy with two young children and work and a hectic life; so I decided just a little ointment couldn’t be soooo bad. Well months and months later after clearly addicting my skin, the ointment stopped working, The red face syndrome was worse than EVER! In addition to being ugly it was painful and looked like a baboon’s behind on my face! The patient, a light complected Caucasian, was seen today for evaluation of a facial eruption which has been present for a number of months. She has been using fluocinolone 0.025% ointment for months, even though we had discussed that this was a medication to be used only on a very short-term basis. Today, she has a fairly florid perioral dermatitis on the chin, sides of the mouth, extending up to the sides of the nose. 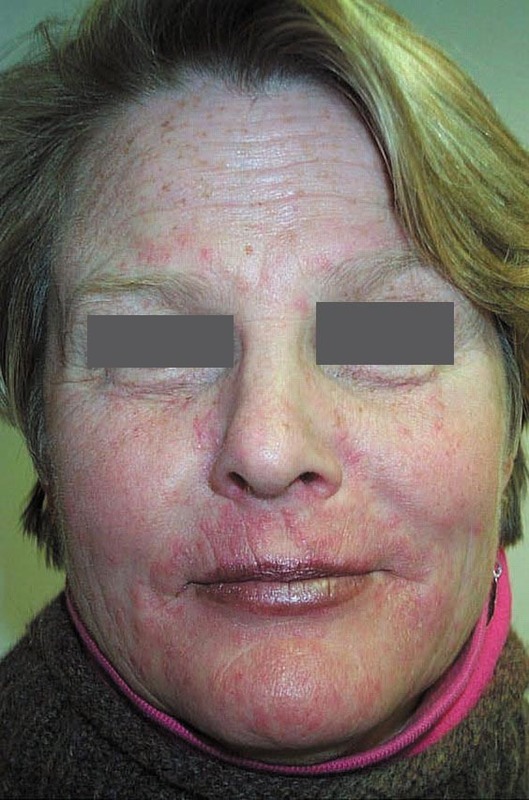 IMPRESSION: Perioral dermatitis secondary to topical corticosteroids (Red Face Syndrome). PLAN: She will need to stop the fluocinolone cold turkey. Doxycycline 100 mg twice a day for a month or so should help. Cold compresses for twenty minutes twice a day for as long as it takes. She will get better. Hers is an early case. Discussion: Perioral dermatitis is a common acne-like disorder seen almost exclusively in women. Topical steroids are contraindicated, except, maybe for a few days to quiet things down. They have the potential to cause steroid addiction which is the result of rebound vasodilation when they are stopped. This can result in the “red face syndrome.” We posted an extreme case of RFS on VGRD Blog a couple of years ago. That patient had been using hydrocortisone valerate 0.2% cream twice daily for twenty years! Some patients with RFS are reluctant to stop the topical steroids. However, the key to success is complete cessation of topical corticosteroids applied to the face, followed by cold compresses twice daily and doxycycline or minocycline 100 mg bid. Tacrolimus ointment may be of value (it was in the case presented on VGRD). It can take weeks or sometimes months for the redness to disappear. Topical steroids can also addict the skin of patients with atopic dermatitis, psoriasis and other disorders; but the literature on that is sparser. Patients with perioral dermatitis and RFS should have their care managed by a physician who is familiar with these disorders. Eyelid dermatitis to red face syndrome to cure: clinical experience in 100 cases. Rapaport MJ, Rapaport V. J Am Acad Dermatol. 1999 Sep;41(3 Pt 1):435-42. Addicted Skin Network: You Tube with Dr. Marvin Rapaport. This video addresses how topical steroids can addict the skin, not just the face. This entry was posted in Elpern, David J. and tagged addiction, cutaneous addiction, perioral dermatitis, Rapaport, red face syndrome, topical steroids by humanemedicine. Bookmark the permalink.